Formula One driver Jenson Button might seem to have everything today but his early life was very different. Jenson makes no bones about it- he owes his success to his father, John. At first glance, you might be forgiven for thinking that the photograph on the left is Jenson – but no, it’s his dad taken in 1978. John too was a racing driver. When his son showed interest, it was John who helped to start Jenson on his career and until he died on 12th January 2014 he was invariably to be seen at Formula One races. He was easy to spot – he was a jovial character who almost always wore pink shirt for luck – and often had a glass of red wine in his hand. When he passed away, the Formula One paddock was stunned – there were so many truly genuine messages of condolence. At the Silverstone Grand Prix that year, Jenson encouraged fans to ‘Wear Pink for Papa’ in tribute. Jenson won the world Championship in 2009 – can you imagine how proud his father must have been? 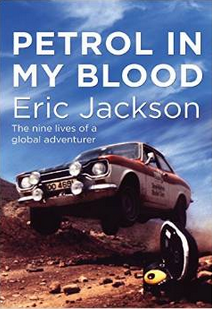 Especially after all those years of trailing up and down the countryside in a battered Transit van, taking his son to kart meetings when he was just a boy. There is a photograph in existence (which I’m not allowed to put here for copyright reasons) of John absolutely beaming when his son received an MBE from Her Majesty the Queen. Jenson was born on 19th January 1980. For a Formula One racing driver he is, shall we say,’mature and experienced’. The 2016 season was our last opportunity to see him driving in Grands Prix. But for those people who will be watching Formula one in twenty years or so (and I’d dearly love to think that I’ll be one of them) then we have to remember that could possibly be producing junior racing drivers. 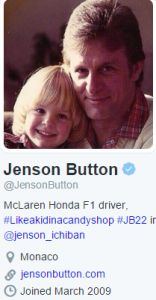 In honour of his dad, Jenson uses this image as his avatar on Twitter – him as a little boy along with his father,’Papa Smurf’. Happy birthday Jenson! The rumours are that Jenson signed a two-year deal with McLaren so fingers crossed we’ll see him driving in 2015 AND 2016, but you know as much as I do that these things can be changed; hopefully not. What a year and a bit it has been for Jenson, but how amazing it would be to see another generation of Buttons taking up the sport. Btw that photo of a young John Button makes me think of Christian Horner!